From Steel to Slots: Casino Capitalism in the Postindustrial City (Cambridge, MA: Harvard University Press, 2016). "Shifting Shorelines: Land Reclamation and Economic Blackmail in Industrial South Chicago," Environment and Planning E: Nature and Space 1, no. 1-2 (2018): 186-205. “Wishing Upon a Star: Christmas Tourism and Urban Renewal in Bethlehem, PA,” Journal of Planning History 12, no. 2 (May 2013): 154-178. “Deindustrialization and the Postindustrial City, 1950-Present,” Oxford Research Encyclopedia of American History (Oxford: Oxford University Press, published online June 2018). "Spectral Shorelines," in Martha Bayne, ed., Rust Belt Chicago: An Anthology (Cleveland: Belt Publishing, 2017). “Chinatown Buses at a Steeltown Casino: Global Flows in a Risk Economy,” in Stephen Fan, ed., Sub-Urbanisms: Casino Urbanization, Chinatowns, and the Contested American Landscape (New London, CT: Lyman Allyn Art Museum, 2014). "Rust Belt Cities Gamble on Casino-Led Urban Development," Next City, September 15, 2016. 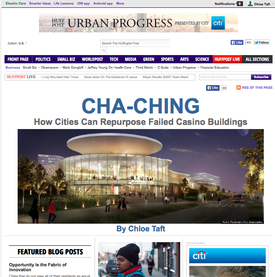 “How to Reuse a Casino,” Huffington Post Blog, September 8, 2014. “Ticket to a New York Casino License is on the Chinatown Bus,” Huffington Post Blog, July 2, 2014. “Detroit’s New Task Force Report is ‘Blight’ on Cue,” Huffington Post Blog, May 29, 2014. The American Scholar, regular contributor to “Works in Progress” section.